Ben Colello and Lincoln-Sudbury took home the 4x400 state championship. Bolze made history in both the long jump and 300 meters with his record-setting season. The Harvard-bound senior set the state record in the 300m (34.19) and earned the state title in both events. He also finished sixth at the nationals in the 400. After claiming the Division 2 cross-country title, Carleo went on to establish himself as the fastest miler in Massachusetts. He won Division 5 and then All-States (4:15.29) before competing at the New Balance Indoor Nationals, where he placed sixth in the country. 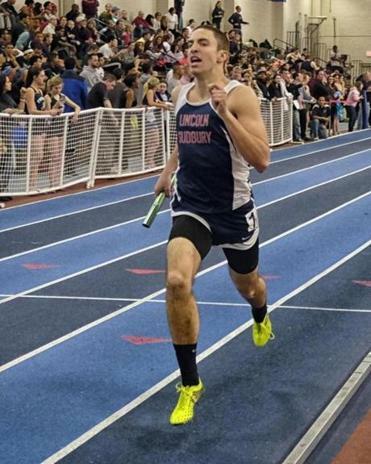 Crawford took the top prize in the 1,000 meters at the New England championships (2:26.11)after placing second at the All-State meet (2:26.42). He was the Northeastern Conference MVP and is also a National Honor Society student working toward becoming an Eagle Scout. Derolus won the Division 1 title at 55 meters (6.53) before taking second at the All-State meet. The junior also set a school record in the 55 with a 6.47 and finished the season with a fourth-place finish at the New England championships. Fofana became the first athlete to place in three individual events at All-States after competing in the high jump, long jump, and 55 meter hurdles. He holds three school records and was the Bay State Conference MVP. Fofana will attend Northeastern. Kim proved impossible to beat this season, never losing a meet and winning both All-States and the Division 1 championships in the shot put. He set a personal record this season of 58-10 and will attend Northeastern University in the fall. Mahoney set a personal best of 9:17.02 in the two-mile at the All-State meet, where he placed first after taking the title at the Division 4 championships as well. Mahoney was undefeated in all dual meets and will run at Brown next year. The Division 1 cross-country champion placed first in the Division 1 championships in the 1,000 meters (2:27.78) before winning All-States with an even faster time of 2:25.45. Montague also won the mile at the State Coaches meet and was a huge part of Newton North’s Division 1 team title. No one could catch Samuels this winter as he sprinted his way to the All-State title in the 55-meter hurdles and Division 1 titles for the long jump and the hurdles. The Northeastern-bound senior also earned the Catholic Conference MVP award. The Cambridge crew of Muna Anosike, Chris Shimizu, Deshaun Velez, Joey Kozlowski and Shaq Anderson established themselves as the fastest 4x200 team this winter. They placed first in the Division 1 championships, first in the Division 1 relays, and first at the State Coaches meet. They also set a record at the Dartmouth Relays (1:32.52), took fourth place at All-States, and finished second at the New Englands. Ben Colello, Otto Zaccardo, Joshua Kerber, and Nick Virkler worked together to take first at the Division 1 state championships (3:27:12), contributing to Lincoln-Sudbury’s fourth-place finish. They also took home the All-State title (3:25.80) for the 4 x 400 relay in an exciting race that involved holding off Natick in the final 50 meters. The Warriors also took second at the Division 1 Relays. Kerber and Colello are seniors while Zaccardo and Virkler return next winter. Paul Hogan, Colin Raposo, Matthew Ackerman, and Eric Salina were runners up at the Division 4 Indoor Relays, won the Division 4 title in a meet record 8:05.18, and finished second at the All-State meet. Then it really got interesting. The team ran a blistering 7:56.56 to finish second at New Englands and at the New Balance Indoor Nationals they placed ninth in an even faster time of 7:53.20. Although Londino has been coaching since 2005, he has been leading the cross-country, indoor and outdoor track teams as head coach since 2009. He has a combined record of 101-29-4 with nine undefeated seasons and was named Malden’s Golden Eagle Mentor of the Year in 2009. After eight years coaching but only one year heading indoor track, Duggan’s team became Hockomock co-champions with a 4-1 record. The Black Knights finished third at the Division 3 Relays. He credits the team’s success to athletes who performed their best in the biggest moments. With Karasch as coach, Needham scored more points at divisionals this season than the past seven years combined, finishing second in Division 2. His team finished with a 5-1 record and won an MIAA Sportsmanship Award. Karasch also coaches at the Rivers School. The former Brockton Enterprise and 2010 Boston Globe Coach of the Year, Welch led Randolph to win the Division 4 Relays and to second place at the Division 4 state championships. Welch also coaches soccer and was a triple jump state champion in high school. In his 19th year coaching at his alma mater, Foley led Newburyport to a 10-0 record and their fourth straight divisional title. The Clippers won both the Division 5 and Division 5 Relays. He has been named the Cape Ann League Coach of the Year 14 times. Atlantic Coast — Dennis-Yarmouth: Keith Barnatchez, Jacob Pawlina, Arun Rambhadjan, Hiroto Watanabe. Falmouth: Wassim Aonnoud. Marshfield: Bennett Ford, Steve Foster, James Marzelli, Matt Meehan, Kenney Parnell, Justin Patterson, Russell Santos, Pat Sheridan, Mike Tautiva. Nauset: Andrew Burke. Plymouth North: Ian Allen, Robert Naidoo. Plymouth South: Jackson Braz. Sandwich: Jake Barry. Bay State — Braintree: Chris Carson. Brookline: Justin Cox, Emmanuel D’Agostino, Jeffrey Santos. Dedham: Jack McCorrison. Framingham: Emmanuel Kalamu, Eric Mellusi. Milton: Philippe Janvier. Natick: Myles Holt, Mike Maichen. Needham: Dan Alpert, Adrian Amaya, Tommy Kelley, Hantzly Murat. Newton North: Nicholas Fofana, Gabe Montague, Ben Porter, Mike Schlichting. Norwood: Tim Buckley. Walpole: Myles Cofield. Wellesley: Thomas D’Anieri. Weymouth: Henry McDonald, Joe Mulcahy, Adrian Radel. Big Three — Durfee: Matthew Baker, Brad Kilby, Connor Riley. New Bedford: Justin Bennett, Noah Gioiosa, Raekwon Grace, Irvin Johnson, Wilberto Torres, Luis Trenche, Jason Vieira. Boston City — Charlestown: Brandon Scott. East Boston: Jose Harry. Latin Academy: Malik Anderson, Xavier Hill, Kenneth Holman. O’Bryant: Brian Donna. Snowden: Joseph West. South Boston: Jeffrey Alcantara. West Roxbury: Adrian Higgins. Cape Ann — Amesbury: Adam Elfiki. Ipswich: Alex Jean-Charles. Manchester Essex: Cameron Holley. Masconomet: Austin Cashin, David Drigo, Harrison Kent, Nolan Rice. Newburyport: Nick Carleo, Tom Graham. Dual County — Acton-Boxborough: Cole Grigsby, Gabe Kline, Will Tejeda, Ben Vitale, Chris Wiggins. Bedford: Samuel Bradford. Boston Latin: Grace O’Brien. Concord-Carlisle: Karl Nyholm, Thomas Ratcliffe, Lior Selve. Lincoln-Sudbury: Nicholas Ackley, Ben Colello, Devon Fitzpatrick, Ryan Honens, Esteafan Jack, Zachary Joachim, Josh Kerber, Joshua Kerber, Ben MacDonald, Nick Virkler, Otto Zaccardo. Newton South: Philip Batler, Omri Cohen, Ben Cooper, Ryan Kim, Noah Shuster, Thomas Stephens, Levon Tiekka. Waltham: Brendan Bonadio, Andrew Brenner, Roger LaCroix, Mike Sargavakian, Anthony Smith. Wayland: Bennett Keyes. Westford: Qadir Barnard-Pratt, Tim Breen, Dillon McGee, Kevin Pawlak, Cody Trudel. Weston: Andrew Connolly, Collins Ebozue, Jeffrey Ivery-Mallard. Eastern Athletic — Bishop Feehan: Matthew Danosky, Anthony Delasanta, Patrick Hodge, Ian Kelly, Brendan Mulligan, Ryan Poholek. Bishop Stang: Adam Estes, Zack Mello. Coyle & Cassidy: Scott McClusky, Daniel McSolla. East Bridgewater: Sam Cooney, Jake Peterson, James Shea. Somerset Berkley: Adam Couitt. West Bridgewater: Adam Petti. Greater Boston — Cambridge: Esu Alemseged, Shaquille Anderson, Muna Anosike, Daniel Aschale, John Borden, Joey Kozlowski, Michael Scarlett, Sam Stubbs, Dashaun Velez. Everett: Lorentz Etienne, Laurynns Joseph. Malden: Cluade Bonnett, Janah Chapman, Julien Kindolphe, Isaac Mukala, Richard Mulo, Mark Ortiz, Nacion Wade. Medford: Patrick Coughlin, Jose Lopes. Somerville: Joao Batista, Nigel Baugh, Marcello Brociner, Demar Chapman, Travis Dolcine, Malcom Ducasse, Kevin Ma, Ben Pierre. Hockomock — Franklin: Jack Riedel. King Philip: John Berdos, Owen Gonser. Mansfield: Curtis Boisvert, James Cooney, Jack Crawford, Mike Duggan, Oliver Erickson, Brendan LoDico, Val Madonna-LunDucci, Chris Murphy, Jimmy Murphy, Josh Ordonez, Andrew Simons. North Attleborough: Jacob McKillon. Oliver Ames: Connor Donovan, Isaiah Matier, Dan Moverman. Stoughton: Lennox Green, David Lockhart, Kevin McDonald, Jordan Taylor. Taunton: Andrew Doherty, Kai Simmons. Middlesex — Belmont: Frederick Maxwell Jones, Chris Sandvik, Lewis Silletto, Ari Silverfine. Burlington: Matt Ackerman, Yash Bhalla, Tanaka Chibanda, Chenet Guerrier, Matt Martin, Colin Rapaso, Eric Salina, Angel Vargas. Lexington: Quinten Clark, Jake Douvas, Ethan Isaacson, Ben Jacobson, Zack Manickas-Hill. Melrose: Christian Gentile. Reading: Tristan Barros, Matt Dynan, Justin Halley, Dorian Johnson, Aidan Kolenick, Aaron LaLecheur, Eric Seferian. Stoneham: David Bergin, Matthew Bergin, Dylan Owens, Guy Wynter. Wakefield: Jackson Gallagher, Anthony Lawson, Aaron Lucci, Armin Palic, Patrick Scheeler. Watertown: James Garbier, Austin Lin, Prosper Lupega, Nick Soares, Michael Stinehart. Wilmington: Eli Jennings, Alex Pizette, Jared Walsh. Winchester: Antonio Oquendo-Loftman, Jacob Zuck. Woburn: Chris Burns, Robby Galvin, Preston Gordon, Kawai Marin, Anthony Nguyen. Northeastern — Danvers: John Thomas. Gloucester: Everest Crawford, Noah Hiller, James King, Calvin Kriputo, Josh Rudolph. Marblehead: AJ Ernst. Peabody: Ben Braz, Drew Fossa, Alexander Greco, Cory Jordan, Michael Ricci, Connor Wolff. Revere: Tarik Maddrey. Salem: Jon Crimble, Aaron Palmer, Tim Ryan, Taron Wigfall. Swampscott: Justin Chasse, Matthew Mahoney. Old Colony — Barnstable: Alex Napolitan. Bridgewater-Raynham: Abu Ceesay, Kyle Dununno, Mark Hamalian, Ben Ivaldi, Andrew Thorson. Dartmouth: Ethan Biron, Stephen Cabral, Evan Davis, Logan Patenaude, Tim Smith, Alex Valm. Patriot — Hingham: Andrew Bolze, Scott Pollara, Clark Ricciardelli, Aidan Ryan, Greg Williamson. North Quincy: Demoy Holding. Pembroke: Alex Bowler, Tyler Bryant, Addison Fine, Phil Martin, Ryan Richards, Bill Stafford, Christian Stafford, Davis Vaconcellos, John Valeri. Scituate: Max Fenton. Silver Lake: Matthew Calabro, Xavier Dillingham, Tyler Keeley, Mitchell Vaughn. Whitman-Hanson: Nick Haley, Brian Sheppard. South Coast — Dighton-Rehoboth: Ty Enos, Alden Foelsche, Jake Junker. Fairhaven: William Oliver. Greater New Bedford: Sean Aldrich, Brady Martin, Zack Viera, Domitri Woodbury. Old Rochester: Sam Allaire, Michael Kassabian, Colin Knapton, Kevin Saccone, Mike Wyman. Seekonk: Andrew Feighery, Zach Garabian, Alex Lanzi, Brian Salit, Tim Salit. Tri-County — BC High: Jordan Samuels. Brockton: Joao DaSilva, Jonathan Derolus, Ronaldinho Diniz, Eddy Fong, Collin Frederick, T’von Gorham, Jehovangi Pierre, Deion Raper, Aaron Williams. St. John’s Prep: Joe Luongo, Matt Mahoney.